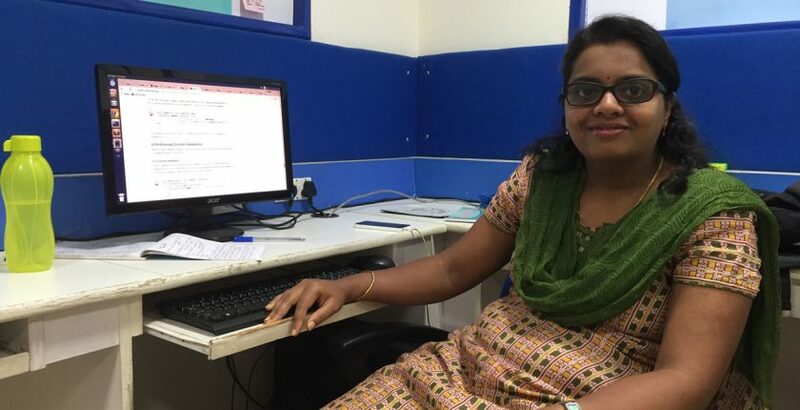 DCT Academy > Blog > Meet our Rails Rockstars > Our Rails Rockstar, Varsha – The Woman who Codes. Our Rails Rockstar, Varsha – The Woman who Codes. Hello readers! This week we write about our ex- Dctian Varsha, whom we are very proud of. Varsha had shunned her career after her engineering degree and got married. However, after many years, she decided to revoke her career and ambition to become a software developer. She trained with us to learn Ruby on Rails and now she is a successful developer in her company, thoroughly enjoying her job as a programmer, while she still manages her household duties. Let us hear more about her experience with us and her path to eventually becoming a software developer. Hey Varsha! Can you tell us something about yourself! Hi, I am an engineering graduate from the field of Computer Science, earning my degree in the year 2010. I am a married woman with a supporting husband and a loving child as my family. I currently work in a company called Qubick as a Software developer. I have started my career afresh nearly after seven years since my education. How did you get to know about DCT Academy? I have always enjoyed programming and wanted to pursue a career in the said field. After my engineering, I had enrolled myself to learn Java. However due to some personal reasons I had to give up this path. Somehow, after seven years, I mustered the courage to start my career. I looked for options which could suit me. I decided to dabble with testing as it is easy to learn. So I enrolled myself into an institute to learn manual and automation testing. That was a terrible mistake. On my very first day I was surprised to see a huge group of people in the class, all religiously essaying down notes, word by word narrated by the trainer. There was no practical exposure at all. Even test programs were made to be written and not executed on computers. It was a messed up way of teaching. I did not learn anything at all. I was at a loss again, without any job in hand. Luckily one of my friends sought to help me and introduced me to Aniruddha. I looked him up in urban pro, he had excellent reviews. Ruby on Rails is one of the frameworks, very much in demand in the software market. I saw a chance to learn programing again and quickly enrolled in DCT to learn Ruby. How has your experience with DCT? I couldn’t have been happier than learning from DCT. Joining DCT has been easily one of the best decisions I’ve made. Aniruddha is such a wonderful trainer and a gentle soul. After such a long gap, I had forgotten everything about programming. Aniruddha’s approach to start explaining from the basics was a relief. He was patient enough to make me understand each and every topic of the subject. He provided me constant guidance through-out the course. The training was rigorous, methodical and was taught with a project based approach, which was exactly what I needed. His lessons are always well planned and meticulous. Aniruddha is easily approachable and ready to clear every doubt we have. In no time, I started grasping the concepts quickly and applying them easily. Now I can build projects and codes easily and I owe all this to his methods of teaching. How are you managing your work – life balance? I must say, it has not been that easy. For the first three months, it was tough managing my office work and my household chores. But determination kept me going. I had constant support from my family. Sooner I got used to it. My ambitions and goals were more important to me than worrying about my troubles. So I marched on. Now I feel lucky enough to enjoy the bliss of having both a career and my family. What message do you have for woman developers who are in a similar position like yourself? I actually want to thank you for this question. Often woman are stereotyped in the I.T companies, as not been able to provide enough dedication to work as they have to manage family. Well, I’ve got news for such people. In reality, it is only a woman who can provide enough dedication to both part of her life. One should never judge a book by its cover. So to all the woman developers, I would like to say, a woman will always play a major role in her chosen field only because of her perseverance, for hard-work is the virtue not born out of gender, but your will. So do not hesitate to foray into whatever field you consider and prove your mettle. Yes of course. As I said, it was one of the best decisions I have made and would like others as well to experience the same while they do wonders in their career. You will never find a teacher like Aniruddha. He is man who solely wishes for the well-being of his students and would help them in every possible way. My entire career is in a bright spot, thanks to him. You will get the best industry level training and absorb the expertise which companies zealously look for. No matter if you are a novice or an industry expert, he trains them both and leaves them satisfied with his training. I would definitely recommend anybody to join him.